Chocolate cupcake recipes can include delicious cupcake recipes that are gluten free and grain free. Learn how to make chocolate cupcakes using nut flours and learn how to adjust the leavening to make lower carb cupcake recipes. You'll also learn how frost your chocolate cupcake recipes 3 different ways using a dark chocolate Ganache recipe. And in a pinch, you could turn your cupcake recipes and the dark chocolate Ganache into a beautiful cake that will be remembered for a long time by whoever gets to consume it. Tip 1: I prefer raw honey over agave nectar because it's lower on the glycemic scale. Tip 2: You can either buy hazelnut flour or make your own at home (preferably using properly soaked and dried hazelnuts). First, remove the hazelnut skins. Then put them into a blender and blend until a nut flour forms. Then sift the flour for a better texture in your cupcake recipes. Whisk wet ingredients together in a big bowl. Then whisk in the dry ingredients until you get a smooth consistency. Use an ice cream scoop to transfer the cupcake batter into the individually lined cupcake pan. Fill to 3/4 of the way full or just a little more. Makes about 10 cupcakes. Bake in a preheated 350 degree F oven for approximately 20 minutes. Transfer to cooling rack. Be sure your chocolate cupcake recipes are completely cool before frosting them. Whip the heavy cream using a stand mixer or use a hand mixer. When cream starts to thicken, add your sweetener of choice and the vanilla. Beat on high speed until cream is ready to use as a frosting. Use a makeshift piping bag and pipe frosting in a circular motion onto cupcakes. Top with edible decorations. How to Make Cupcakes Look Spectacular! Heat cream - preferably in a double-boiler and bring to a bare simmer. Add in the chocolate chips and stir until completely combined with the cream. Remove from heat and let Ganache cool for a few minutes before using as a frosting. Tip 1: Decorate by adding toasted nuts, toasted coconut, cocoa powder, sprinkles, etc. to your cupcake frosting. 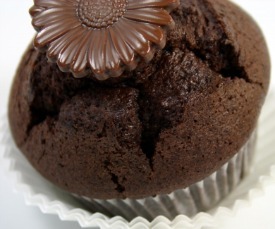 You can use a Ganache recipe to pour over your chocolate cupcake recipes to give it that glossy look. Or whip completely cooled Ganache to create a fluffy lighter frosting that's great for piping. Or keep Ganache at room temperature until it hardens to a spreadable frosting for your chocolate cupcake recipes. 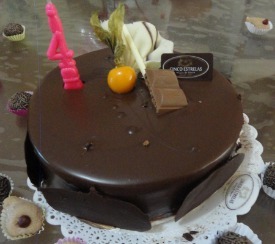 When you pour your chocolate ganache recipe on your cupcakes - it should look as spectacular as this cake. Tip 2: Use your chocolate cupcake recipes to make a quick chocolate cake for that special occasion. Use a dark chocolate Ganache recipe as the frosting for a spectacular looking Birthday, Anniversary, Mother's Day, Father's Day, or Valentine's Day Cake. I've never used palm shortening, but it would probably make a better frosting than coconut cream which may create a soggy cupcake. Palm shortening is made from palm oil that has had some of its unsaturated fats removed, giving it a firmer texture and high melting point. Supposedly, palm shortening is not hydrogenised and contains No trans fats. Add dry and wet ingredients to a large bowl. Then mix ingredients together until well combined. Then pour batter into your lined cupcake pan. Recipe should make 9 cupcakes. Bake cupcakes in a preheated 350 degrees F oven for about 15 to 18 minutes. Check to see if done by using a toothpick. Cool your cupcakes on a cooling rack. Your cupcakes must be completely cool before you can frost and decorate them. Beat ingredients with a hand mixer until thick enough to frost cupcakes. Then pipe frosting on top of your cupcakes or spoon frosting on cupcakes. Do you love to adjust other people's recipes, but have been confused about how much leavening you really need to use when you change a recipe? Well maybe this information will finally help you to avoid that funky metallic off-taste that sometimes occurs when you cut down on the amount of sugar in recipes. When adjusting a chocolate cupcake recipe to be lower in carbs or sugar, you need to understand how to adjust the leavening. Use a gluten free baking powder if you are following a gluten free diet. The following ratios are good to know, so that you can evaluate recipes before actually baking to ensure success. And baked goods with a lot of heavy ingredients like carrot cake cupcakes, may need a tiny bit more leavening.